Home/Archive by Category" Food Irradiation"
*** IMPORTANT NOTE: If you buy more than one book, you need to do so in separate transactions in order to have maximal effect – because five books bought in a single transaction will only register as one purchase in the way the bestseller list is tabulated. Also note that you can have the e-book edition delivered to someone by providing their email address when you purchase. First, by pushing this book to the NY Times bestseller list, we will be making people pay attention to it. Monsanto and its allies are desperately hoping that it will be ignored so that the fraudulent foundation of the GE food venture will stay hidden. But if it’s on the bestseller list, and remains there for many weeks, it can’t be ignored – and Steven will be increasingly interviewed by key media outlets, which will bring the startling revelations in his book to the attention of a large portion of the population and to influential individuals, disclosing how they’ve been systematically deceived by those whom they had a right to trust. Second, you owe it to yourself and your loved ones to become more fully informed about this vital issue, not only so you can protect yourself and them more effectively, but so you won’t be taken in by the misleading propaganda to which you’re regularly subjected. Third, by reading this book, you can intelligently push back against the false claims you routinely encounter from people who have been taken in by the propaganda. Moreover, we recommend that besides buying a book for yourself, you buy several to give to friends and relatives who regard you as unscientific or unreasonable for being concerned about GE foods. Ask them to read it and then have a discussion with you based on the actual facts. You will most likely find that their minds have been changed. So please act promptly. Your purchases will be part of an important process that can topple the entire GE food venture. 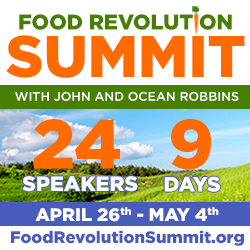 Three years ago, our my friends John and Ocean Robbins began a modest summit that they hoped would help inspire people to learn more about healthy food. The information from that summit spread like wildfire and has inspired over 150,000 people from all over the world! This year, they’ve stepped it up to a whole new level. There’s more urgency than EVER before… For you, your health, the health of your loved ones, as well as for our struggling planet. Joining John and Ocean Robbins are celebrities like Woody Harrelson, Jane Goodall, Alicia Silverstone, Amy Goodman, and MORE! These cultural persuaders are joining with expert doctors and food activists because they’ve realized that if we don’t do something now, we’re in trouble. They’ve chosen to use their platforms and names to inspire a critical mass where health becomes the norm. Without a revolution, we are left in the hands of companies like Monsanto and Coca-Cola, who have spent tens of millions of dollars in recent years trying to stop anything that would interfere with their relentless pursuit of profits. Think they care about our health? No way. Their bottom line is green, all right. But when healthy food is gone, you can’t eat money! This is a major globally broadcast summit. John and Ocean Robbins, the hosts, have made it completely complimentary for you to participate. You can listen in the comfort and convenience of your own home, from your computer or phone. Plus, this is cool: When you register, you’ll get a copy of The Real Food Action Guide, which reveals medical breakthroughs the corporate food industry hopes you never discover, and gives your family the truth about GMOs. 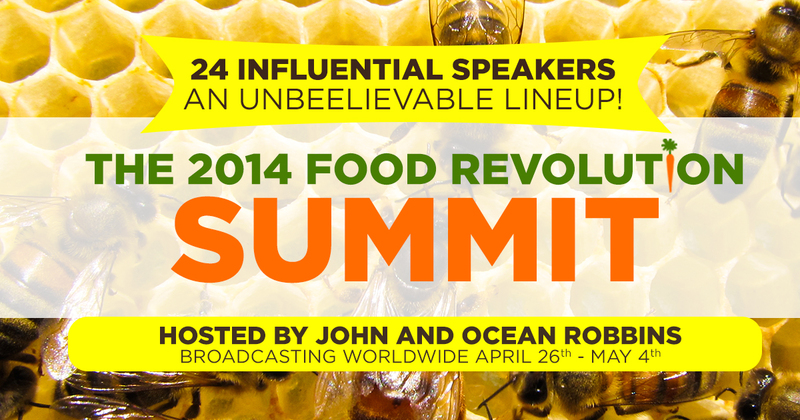 Again, there’s no cost to attend the online Food Revolution Summit event, happening April 26 – May 4. Get your access details now. You’ll hear directly from Jane Goodall, Woody Harrelson, Alicia Silverstone, and 20 more brilliant speakers! Donate your time and/or money to FFAN’s crucial effort today! Keep harmful radioactivity out of our children’s food. Submit Your Comment to the FDA: Insist they lower the acceptable levels of radioactive contaminants allowable in our food supply. Write a Letter (sample here) to your Representative to demand FDA do their jobs to protect our families by monitoring our food supply. Join FFAN on Facebook to get up-to-date information. Radiation continues to emit from Japan’s Fukushima nuclear plans, affecting the global environment and food supply. Education and awareness are key. Donate $5 to FFAN Today! Help us continue this vital work. 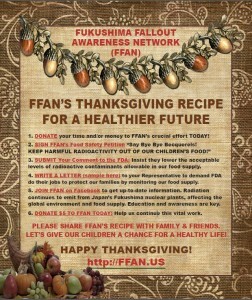 Please share FFAN’s recipe with family and friends. Let’s give our children a chance for a healthy life. California’s Prop 37, the California Right to Know Genetically Engineered Food Act, will require the labeling of genetically modified (GM) and genetically engineered (GE) foods. The list of those organizations, newspapers and pundits calling for support of Prop 37 continues to grow. The latest voice to join the chorus is Mark Bittman, blogger for the New York Times. Read his editorial from the September 16th edition here. NEW YORK, NY – In two days a diverse coalition of organizations, businesses and individuals will begin to march from the Historic Flatbush Food Co-op in Brooklyn, NY to the gates of the White House to ask the Obama Administration to support labeling of genetically engineered foods, also termed “Genetically Modified Organisms” or “GMOs”. The GMO Right2Know March will feature daily events between New York and Washington, DC October 1-16 as hundreds of marchers are expected to walk part or all of the 313 miles to the White House. The route and details on daily events can be viewed at Right2KnowMarch.org. “Pesticide companies develop Genetically Engineered food crops by combining DNA from plants, animals, bacteria and viruses, to contain or resist pesticide, which results in more pesticides sold and sprayed,” says Michael Hansen, Chief Scientist of Consumers Union. “Genetically engineered foods contain untested novel foreign compounds that can be detrimental to our health, just as they are to the environment and farmers’ livelihoods. American consumers deserve the choice whether they want to eat GMOs, just like their counterparts in Europe and Japan,” says Hansen who will join the Oct 1 NYC Right2Know March kick-off rally at Prospect Park at 11am to 1pm followed by marchers walking across the Brooklyn Bridge to the United Nations. Helping lead the march is Joseph Wilhelm, President of Rapunzel and Indian activist, Dr. Vanadana Shiva, both veteran GMO campaigners who twice marched across Europe for controls on GMOs and in support of GMO labeling, which is required in the EU. They will be joined at the events in NYC and Washington, DC as well as along the march, by advocates, media personalities, farmers and business leaders who will speak out for GMO labeling, including: Andrew Kimbrell (Founder, Center for Food Safety, Frances Moore Lapp? (Author, Diet for a Small Planet), Michael Hansen (Senior Scientist, Consumers Union), George Siemon (CEO, Organic Valley) and many others. “No matter what you believe about GMOs, the bottom line is that we have a right to know what is in our food so we can all make better decisions for the health of our families,” says TV host and green lifestyle author Sara Snow. Founding organizations of the Right2Know march include the International Federation of Organic Agricultural Movements (IFOAM), the Non-GMO Project and the Sustainable Living Roadshow, who are joined by founding organic brands Dr. Bronner’s Magic Soaps and Rapunzel. In recent months, numerous titans of the organic and natural food sector have become sponsors of the Right2Know March including: Nature’s Path; Organic Valley; Stonyfield; United Natural Foods Incorporated (UNFI); Nutiva; Kamut International; and Dr. Hauschka Skin Care. Members of the media are encouraged to follow the entire organizing effort and report on our progress. Please sign up for email alerts through our website or call Adam Eidinger 202-744-2671 to arrange interviews or for in person requests. Members of the public should call the Right2Know March Hotline: 202.557.5164 or email erica@right2knowmarch.org . Additional sponsors and affiliates include: Weleda; Biodynamic Farming and Garden Association; Center for Food Safety; Food Democracy Now; Organic Trade Association; The Organic Center; Independent Natural Food Retailers Association; National Cooperative Grocers Association; Farm and Ranch Freedom Alliance; Northeast Organic Farming Association’s of New York, Vermont, and Connecticut; National Organic Coalition; Organic Farming research Foundation; Food and Water Watch; Pennsylvania Association for Sustainable Agriculture; Organic Consumers Association; Sustainable Food Trust; Truth in Labeling Coalition; Organic Seed Growers Association; Institute for Responsible Technology; and Cuatro Puertas. Please ask President Obama to veto this legislation so that consumers — not industry lobbyists and agri-business cronies — can develop a true food safety bill that will improve this country’s food-safety system, not bog it down with paperwork, smoke and mirrors.